Special ID release date was Friday, March 7, 2014. This was a Limited in theaters release. 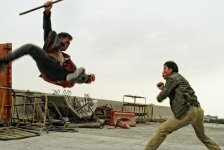 Donnie Yen is Zilong "Dragon" Chen, an undercover cop deep inside China’s most ruthless crime syndicate. The boss, Xiong (Collin Chou) swears to find every traitor and make them pay with their lives. Agents are turning up dead. His days are numbered. Desperate to protect his family and his life, Chen must risk everything to protect the SPECIAL IDENTITY he never wanted before it’s too late.